Built in mid-12th century by King Alaung Sithu, the Thatbyinnyu Temple is an incredible place to go back in the past and relive the historic times. This is also the highest temple in Bagan but you’re not allowed to climb to the top. Also, this is the busiest of all temples and during the sunset, the tourists visit this incredible place in huge numbers. 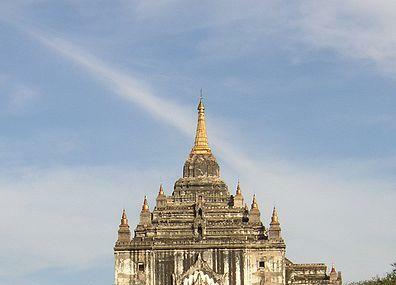 Moreover, it is one of the few temples in Bagan which are in a good condition and have passed the test of time. How popular is Thatbyinnyu Temple? People normally club together Mahabodhi Paya and Buphaya Paya while planning their visit to Thatbyinnyu Temple. Nice place and food i clean Cheaper grate myanmar tradition rice. It is not far from the famous Ananda temple. This structure of imposing majesty towers over other temples in the vicinity. With elaborately decorated stupas on all corners of this double storeyed temple, it has been built to signify the omniscience of Lord Buddha. The elevation literally inspires one to rise above the mundane and attain divinity. 11 Centure ear religious of bumar temple.